While Samsung has begun to report what the security patch for December will bring, some devices are still catching up to the previous update. Despite being a little late to the party, T-Mobile is finally rolling out the November security update for Galaxy S6 Edge+ and Galaxy Note 5 devices. 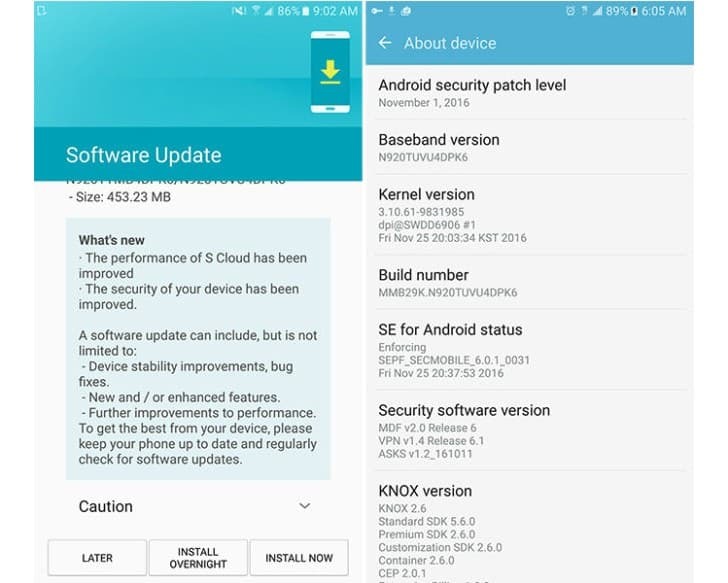 The major United States network carrier has started the new firmware update just days after it released the same for Galaxy S6 and S6 Edge. The firmware version G928TUVU4DPK6 for Galaxy S6 Edge+ and N920TUVU4DPK6 for Galaxy Note 5 should nothing more than a bunch of vulnerability fixes and optimizations. Being an incremental update, the November security update for Galaxy S6 Edge+ and Galaxy Note 5 should be out for all users across the United States in the coming days. You can always manually check for the update by accessing Settings->About phone->Software update->Check for updates. If you want to stay ahead of the line when it comes to Galaxy S6 Edge+ and Galaxy Note 5 updates, make sure to check out our Samsung firmware update platform. All the firmware updates are available for free and can be downloaded securely from our dedicated servers.